. 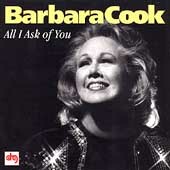 In a career that spans the second half of the twentieth century, Barbara Cook has achieved a status accorded only a handful of Broadway performers. Her influence on other artists has been as great as that of Ethel Merman, Mary Martin or Alfred Drake and she remains the definitive Broadway ingenue. Unlike these other performers she is still with us and still working. In her entire career she has released less than a dozen albums, the great majority of those recorded after her fiftieth birthday. All have been distinguished by the same qualities of glorious and joyful singing, impeccable taste and – perhaps most importantly – a degree of intelligence in lyric interpretation rare in any genre. It is probably this last quality that has enabled Cook to switch with such success from Broadway performer to cabaret artiste par excellence. What still surprises about Cook is her versatility. She is a soprano – possessed of the clearest, sweetest and most accurate of instruments – and yet she can swing like a band singer. Never a belter, she tackles material normally associated with far brassier voices with aplomb. Her Come Rain or Come Shine (from Live From London) is the equal of Garland’s. Make The Man Love Me, from Close As Pages In A Book, her 1993 tribute to Dorothy Fields, is one of the most heartbreakingly gorgeous evocations of unrequited love ever recorded. She offers further proof of this versatility on her new album when, in the space of three tracks, she moves from the deceptively gentle emotional devastation of In Buddy’s Eyes, via a torch song – Arlen’s I Wonder What Became of Me – to a bouncy little burst of youthful romantic confusion, You’re A Builder Upper. The first of these tracks also illustrates another remarkable aspect of Cook’s talents. She recorded the same number 15 years ago when she appeared in the legendary Avery Fisher Hall concert performances of Follies. Listening to one after the other, it is nigh impossible to tell which version came first. Except that, if anything, the second is even more successful in enunciating the desolation of a woman caught in a marriage to a kind and decent man who she doesn’t – probably never has – loved. The rest of Cook’s recital consists of largely familiar material from Broadway and Hollywood’s golden age. The exceptions open and close the album. The title track is, indeed, that song from Phantom. The album’s closer is the delightful We’ll Be Together Again and it is no exaggeration to say that Cook’s interpretation is the equal of Sinatra’s in it’s gentle, lilting warmth on this sweetest and most optimistic of laments. In between, she offers fine interpretations of Glad Rag Doll, Somewhere and Bock and Harnick’s sweetly humorous take on the predatory female, The Very Next Man. For many, the highlight will be a medley of songs from one of Cook’s greatest stage hits, She Loves Me. These numbers have been featured in her concert and cabaret appearances for 25 years and, yes, she still hits that note at the end of Ice Cream. The arrangements are, as ever, by Cook’s redoubtable sidekick, Wally Harper, who also conducts the sizable orchestra. Cook remains at the peak of her powers. All I Ask Of You, will delight her fans and anyone still unfamiliar with her work will be able to hear how her straightforward, emotionally honest approach to a song has kept her at the top for so long.